Mughal art broke new ground in the use and representation of the floral motif in painting. While flowers were a common motif and an integral part of design in Indian art from very early times, it was only with the emergence of the Mughal school that they became subjects of paintings, rather than embellishments, and here too, only from the start of the seventeenth century. "My heart, like the bud of the red, red rose, Lies fold within fold aflame; Would the breath of even a myriad Springs Blow my heart's bud to a rose? " His fascination for flowers, especially the rose (gul in Persian) was so deep that he named his daughters Gul-chihra Begum, Gul-izar Begum, Gul-badan Begum, and Gul-rang Begum. 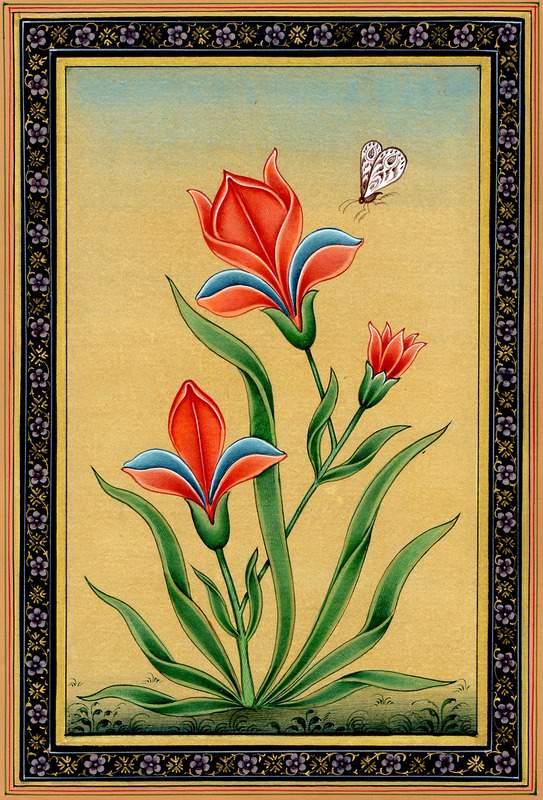 Mughal flower paintings are typically meticulously drawn twigs with leaves, buds, and flowers, in a variety of arrangement, flawless in depiction and fully conforming to the rules of naturalistic study without losing its essential aesthetic appeal. The background is mostly treated plain except for a slight suggestion of aerial perspective with the help of a fine strip across the top, without defining the horizontal line. Total focus is laid on the main subject which suggests the artist's inclination to project it in all its genuine objective form. In such paintings, in order to enliven the surroundings and capture a certain rhythm of movement, as well as to manage the compositional aspects, the Mughal school prefers to depict a butterfly hovering over the blossoms. This is done to achieve a greater impact of naturalistic environment through a kind of relational placement of the main object and other minor living things (flying) in nature; also, he introduces through the hovering objects a sort of freedom of movement in the space around a still-life exposure of the main object. Besides, in the selection of the hovering objects, there is an attempt not only to suggest the skyline, but also to intensify the naturalistic impact of the flower study through the addition of ecological harmony that exists in nature. The pale background does help in brightening up in relief the flowering plant as a whole, and also enhances with ease vertical movement without having to concentrate much on spacing the sky as one might expect otherwise. One may note that the clustering of the leaves is composed with a deliberate purpose and design: at the base it is denser, suggestive of the plant being rooted in the soil; while in its upward growth the leaves have generally a light openness balanced by a bud, and then there is a full focus on the flowers showing different folds of petals concerting with various stages of blossoming. The Mughal artist tends towards a naturalistic rendering of flora and fauna. An Indian element, that is, sympathy with the animal world, further gives rise to emotions and feelings in their representation. But in no way is the animal world the subject of "adoration" in their art as it is in the sculpture and painting of ancient India. Mughal painters clearly aim at the portrayal of physical reality where spiritual and emotional matters hardly have a place, in other words a scientific approach. This aspect of Mughal aesthetics obviously lends their creations a quality of earthly charm and pleasure. Grousset has rightly remarked that Mughal studies of wildlife are frank material, intended to give earthly pleasure. The Mughal artist's approach finds expression in an emphasis of objectivity in the presentation of nature. This best suits studies of specimens intended to depict maximum possible detail.